My DNS server is pointed at the ip of the debian box, which runs dnsmasq. It has a ton of apache sites configured that all have names like clientname.debserver.local - all which resolve fine from the other machines around the lan (not Yosemite). Apple has provided some related documentation here. In which they recommend avoiding .local if you can and instead using a suffix such as .private, .intranet, .internal, or .lan. The reason .local should be avoided is because it's used by the Bonjour service. Here local is the top-level domain name configured to respond to and 127.0.0.1 is the IP address of the server to use. I looked to see if I had that directory by default and I did not, but I did notice I had a file /etc/resolv.conf which existed by default. I have not attempted, but if the solution in the article is unsuccessful I would try using this pre-existing resolv.conf file.. under the assumption.. it must be there for a reason. 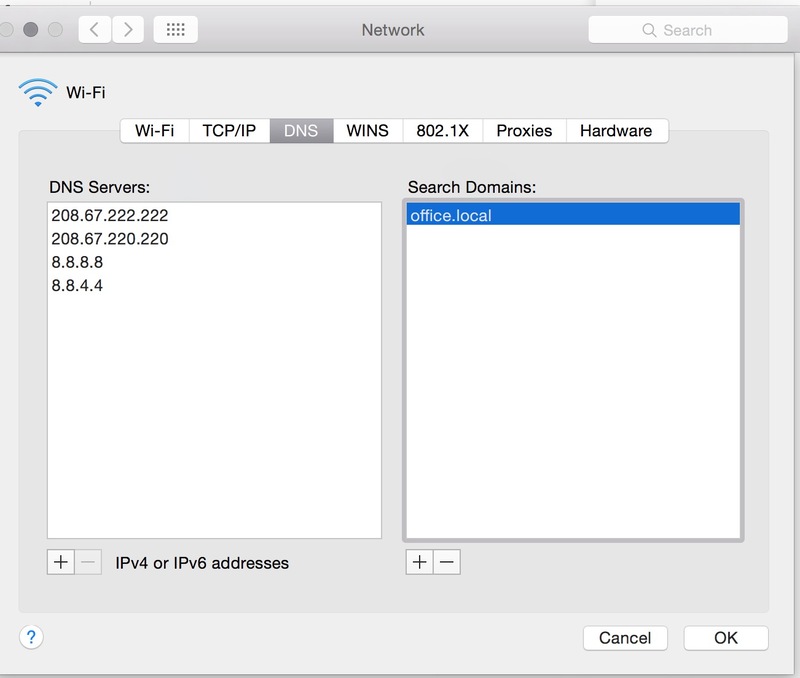 Apple does not resolve .local using a DNS server, but Apple Bonjour its zeroconf impementation. You could install Avahi the Linux and BSD implementation. See https://apple.stackexchange.com/a/152892/65787 for a way to automate sudo discoveryutil mdnsactivedirectory yes which forces DNS resolution of .local domains on Yosemite. If you have just the one Mac and the ip addresses don't change, you can bypass the whole problem and put the name/address in /etc/hosts. People forget, there was a time before DNS where we kept the hosts files synched by uucp'ing them around. Not the answer you're looking for? Browse other questions tagged yosemite . Discoveryd Alternative to Replace mDNSResponder Argument? How to resolve dropping wifi issue since Yosemite upgrade?